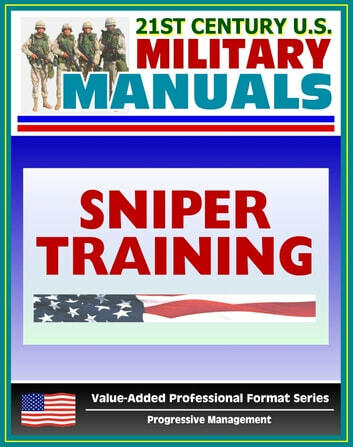 Professionally converted for accurate flowing-text e-book format reproduction, the Sniper Training Army field manual (FM 23-10) provides information needed to train and equip snipers and to aid them in their missions and operations. It is intended for use by commanders, staffs, trainers, snipers, and soldiers at training posts, Army schools, and units. 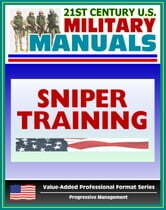 This manual is organized as a reference for snipers and leads the trainer through the material needed to conduct sniper training. Subjects include equipment, weapon capabilities, fundamentals of marksmanship and ballistics, field skills, mission planning, and skill sustainment. The left-handed firer can become a sniper, but all material in this book is referenced to the right-handed firer. The sniper has special abilities, training and equipment. His job is to deliver discriminatory highly accurate rifle fire against enemy targets, which cannot be engaged successfully by the rifleman because of range, size, location, fleeting nature, or visibility. Sniping requires the development of basic infantry skills to a high degree of perfection. A sniper's training incorporates a wide variety of subjects designed to increase his value as a force multiplier and to ensure his survival on the battlefield. The art of sniping requires learning and repetitiously practicing these skills until mastered. A sniper must be highly trained in long-range rifle marksman ship and field craft skills to ensure maximum effective engagements with minimum risk. The primary mission of a sniper in combat is to support combat operations by delivering precise long-range fire on selected targets. By this, the sniper creates casualties among enemy troops, slows enemy movement, frightens enemy soldiers, lowers morale, and adds confusion to their operations. The secondary mission of the sniper is collecting and reporting battlefield information. A well-trained sniper, combined with the inherent accuracy of his rifle and ammunition, is a versatile supporting arm available to an infantry commander. The importance of the sniper cannot be measured simply by the number of casualties he inflicts upon the enemy. Realization of the sniper s presence instills fear in enemy troop elements and influences their decisions and actions. Contents include Mission, Organization, Personnel, Sniper and Observer Responsibilities, Team Firing Techniques, M24 Sniper Weapon System, Operations and Functions, Inspection, Care and Maintenance, Disassembly, Loading and Unloading, Storage, Ammunition, Types and Characteristic, Round-count Book, M24 Malfunctions and Corrections, Sniper Sighting Devices, M3A Scope, Iron Sights, Other Equipment, Image Intensification and Infrared Devices, Observation Telescope, Binoculars, Other Sniper Equipment, Radio, Radio Transceiver, Marksmanship, Fundamentals, Steady Position Elements, Aiming, Breath Control, Trigger Control, Follow-Through, Calling the Shot, Integrated Act of Firing, Ballistics, Types of Ballistics, Terminology, Effects on Trajectory, Angle Firing, Wind Classification, Wind Velocity, Conversion of Wind Velocity to Minutes of Angle, Effects of Light, Effects of Temperature, Effects of Humidity, Sniper Entries, Holdoff, Elevation, Windage, Engagement of Moving Targets, Techniques, Common Errors, Calculation of Leads, Nuclear, Biological, Chemical, Protective Mask, Mission-Oriented Protection Posture, Camouflage, Target Indicators, Basic Methods, Types of Camouflage, Ghillie Suit, Field-Expedient Camouflage, Cover and Concealment, Movement, Sniper Team Movement and Navigation, Selection, Occupation and Construction of Sniper Positions, Positions in Urban Terrain, Observation, and more. This reproduction includes FM-1, The Army Field Manual, a capstone manual containing the vision for the Army - sold separately for $5.99. FM 1 establishes the fundamental principles for employing Landpower.